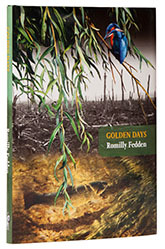 Fedden wrote Golden Days while serving in the army on the Western Front during the First World War and it isn’t surprising that the result is an elegiac memory of a time before the world went mad. It has always been a popular work and if I had to describe it in less than half a dozen words, I would say it was a first class, second rank angling memoir, but the thing that really makes it stand out from the pack is that it is a memoir of fishing in Brittany, which catapults it into that oh so rare class of books written in English about fishing in France. In much the same way that Sassoon sets the reader up for the final chapter of Memoirs of a Fox Hunting Man, Fedden’s writing contrasts the carefree days of the early century with the knowledge that he is describing the end of an era. After August 1914, nothing would ever be the same again – which is not to say that Fedden idealises the pre-war status quo – alongside his descriptions of happy times are many tales of waters which could have been great had they not been poached to death. This isn’t the lost fantasy of Barker’s An Angler’s Paradise, which leaves you wondering why the man ever left Ireland, or how the rivers all became so much smaller after Barker went; it is a much more realistic view of lost innocence. The book itself is 124 pages long and is well produced, with a tipped in colour plate of flies painted by Fedden. As an added bonus, you also get the most extraordinary collection of introductory text I have ever seen in a book of this type, which starts with Bruce Lockhart’s introduction to the 1949 edition; continues with an appreciation by the great Nick Lyons; followed by a useful biographical note by Claude Belloir; acknowledgements by the publisher; and finally by a foreword written by (and partly about) Geoffrey Bucknall. By the time you have read 24 pages from this class of writer telling you everything you could possibly want to know about Golden Days, everything that follows comes as a bit of an anticlimax – so will you humour me and if you buy this, read the book first and the introductions second?